The Town of Luang Prabang is noticed for its special form of urban development, partly traditional Lao and partly colonial. This 19th and 20th century devolpments have resulted in a blended townscape that has been well-preserved. 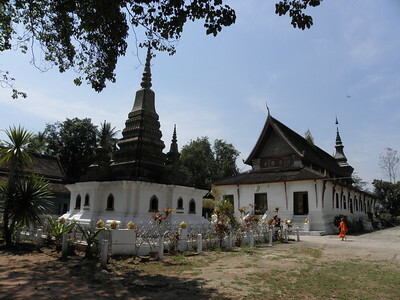 Luang Prabang originated as a defended royal administrative complex, with adjacent temples and monasteries. Luang Prabang is located in north central Laos, on the Mekong River. Until the communist takeover in 1975, it was the royal capital and seat of government of the Kingdom of Laos. I am sorry to say that this was another disappointment, another case of probably expecting too much (like the Ellora Caves). Luang Prabang is almost unanimously praised. And sure, maybe I was "late" and the town is too commercialized now. But I don't believe that the essence was much different 10 years ago: Luang Prabang has a great location and a charming atmosphere. But let's be honest: there's not a whole lot to see. I think that a lot of people enjoy coming here because of its mediterranean feel - it's slow, sunny, romantic. There are dozens of cafés and restaurants. You can unwind, relax. It's also quite a contrast with Bangkok or Hanoi, two cities where most people fly from into Laos. I travelled through Laos from South to North (leaving Luang Prabang for the last), so I had already got used to the country's quietness, the baguettes and Lao Beer. Luang Prabang certainly is lacking authentic historic sights. I have read the AB evaluation a couple of times now, and it's thin, very thin. All's bad then, avoid it? No, certainly not. I loved Wat Xieng Thong with its glittering exterior mosaics. The former Royal Palace is also worth a visit. But don't confuse Luang Prabang with the whole of Laos - I enjoyed my stay in the South (an almost different country from the North), the East (with its Plain of Jars and turbulent history) and the various forms of land and river transport that will get you around the country, eventually. As my first stop in Laos I visited Luang Prabang, the former capital of Laos. The main components of the site are situated at the confluence of Mekong and Nam Khan rivers. The town boasts several temples, some French colonial buildings and the former royal palace, albeit that last one is rather amusing than impressive. My highlight was the Wat Xieng Thong temple. And the overall relaxed mood of the city. Luang Prabang has some domestic flights. It has also a few international connections to China, Vietnam and Thailand. My impression was that it's actually better connected internationally than the capital, Vientiane. Apart from the flights there are also busses and the more touristy mini busses taking you to most parts of the country. Specifically, Luang Prabang is the closest major town for Phonsavan and the Plain of Jars. I think the town can be visited in half a day (or even a bit less). Still it would be a pity if you left early. Plus, the bus connections may very well force you to stay at least a night. You have plenty of good restaurants to choose from in Luang Prabang. 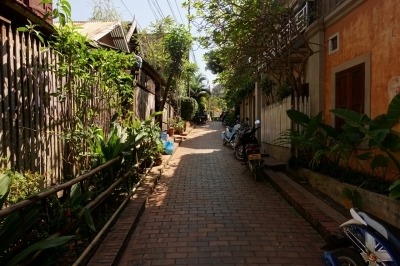 The town also offers Laotian cooking classes and daily yoga classes. Only isssue I had that it get's really warm around noon so it's not a good time to stay outside and move around. If you plan to venture outside (I didn't) there are daily boat excursions to the Pak Ou cave. You can also go via tour or by shared cab to the Kuang Si Waterfalls. I visited this WHS in February 2011. Luang Prabang is a perfect fusion of traditional architecture, Lao urban structures and European colonial structures built in the 19th and 20th centuries. There are several wats to visit and nearby Buddhist caves. The highlight of my visit though was giving early morning alms to the Buddhist monks of the town. A totally unique experience and one of my favourite WHS. I have to admit that I really do not want to write this review as I do not want Luang Prabang to be changed by influx of tourists that may decided to visit this one of the most stunning places in Southeast Asia after read this review. Luang Prabang as I mentioned one of the best places to visit in this region was the former capital of ancient kingdom of Lan Xang or the land of million elephants, Luang Prabang was one of the cultural centers of this region; many temples in such small town are the greatest testimony of local wealth and civilization. Sadly that Luang Prabang as present is just the shadow of its former glory as the town had been destroyed by Chinese invasion, most of the temples and town were rebuilt in 19th and 20th centuries, so this town is quite unique as the town had been rebuilt in the time that French had started its influence in Indochina, so this town has unique blend of local and colonial architectures as well as urban layout. For amazing local architecture and art, temples are the places to see, Luang Prabang has many temples, although the town can not compete on the number of temple like Bangkok or Chiang Mai in Thailand which has more than 300 temples in each city, the art of Luang Prabang temple is in the same league of beauty and maybe more appreciated to admire. The top three of the must see temples are Wat Xiang Thong, the former royal temple and the sole survivor from the town destruction is famous for it graceful main chapel called “sim” and colorful mosaic decoration, the tree of life mosaic behind sim is one of the best art in Asia. 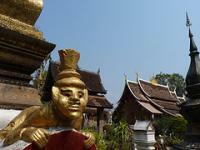 Wat Sene, this stunning temple has beautiful golden decoration and is one of my favorite. 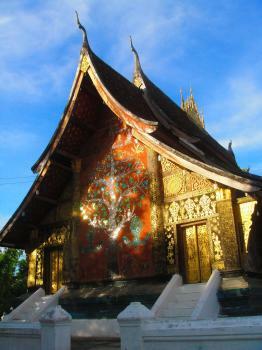 Wat Mai with its 3-cm thick golden coated wooden wall is maybe one the most stunning art in this small town. Not only temple the town offered, its old palace and colonial quarter are also interesting. The palace’s main hall and its chapel that build to keep Prabang Buddha, the holy Buddha statue that the town named after, are the must see. However for the colonial quarter is not a top sight, the buildings are pretty, but most of them have been turned to be restaurants or shops for backpackers. Actually the colonial area is easily divided into two areas to serve two groups of tourists, backpackers and well spend tourists – a real tragic of tourist business for this town. In the palace area, many small tour agencies and restaurants making this area to be liked the infamous Khaosan of Bangkok, while in Wat Sene area is full of beautiful restored colonial houses that turned to be boutique hotels, spas and really nice art galleries! Tourism has already changed this town; everywhere seem to be for tourists, the old colonial buildings become hotel complexes, daily well organized night market for tourist to shop with no product for locals, double price for foreigners, Buddhist ceremonies have been treated like cultural shows and etc. Luang Prabang is suffering since its soul is gradually destroyed by tourism; UNESCO only can keep the buildings, but can not protect the town characteristic. In my opinion, Luang Prabang is not so such special or unique in terms of architecture; there are many similar beautiful temples or towns in nearby northern Thailand, the former Lanna Kingdom, the sister kingdom of Lan Xang, but Luang Prabang is maybe the last bastion of this region that still can perfectly keep its bygone age atmosphere of Indochina, and that is the uniqueness of this town that should be kept and the only thing that we can help this town is being a responsible tourist with lots and lots respect to its glory heritage. Luang Prabang is truly depended on our decision while we are in this fragile jewel. Coronation Locations: The last king of Laos decorated and refurbished Luang Prabang royal palace for his coronation, before the end of his monarchy. Fusion: "fusion of traditional architecture and Lao urban structures with those built by the European colonial authorities"
201 Community Members have visited.